That, folks, is what my 2.5 year old (as of yesterday) told me today. She being 'Cracker Baby' (that is, apparently, a baby who eats crackers). She told me this when she climber on her bed with Baby Jesus (a girl dolly) and Skulish Bear (named for the Ukranian lady who gifted her with it). Pictured here performing her amazing Three Sookies at Once Trick, heretofore only shown to paying circus audiences. Currently in her room singing "Rockabye Shower int he tree top, when the wind blows the elephant will rock" ~ Shower being her stuffed elephant so named since elephants shower themselves. 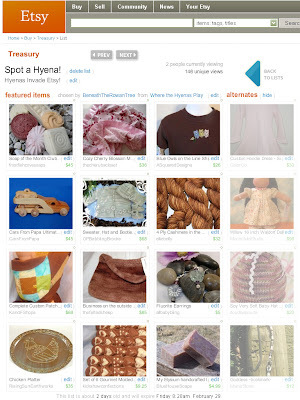 What fun to find so many of the talented Hyena Cart artists and crafters on Etsy, and even more fun to snag a Treasury (think temporary art gallery, I got to play curator) to feature them! Over the course of my 3 days, I managed to change up the collection 4 times and feature a nice cross section of items, styles and colors showcasing the variety of skills and richness of talent found at HC. Many thanks to the Hyenas who pointed me along the path towards other hyenas in Etsy land. 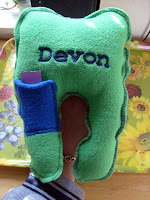 Makes Etsy feel a little more homey to find these mamas there. I didn't grab the first and second incarnations, but I got the third and fourth! Nicole in that we are ‘neighbours’ as far as WAHMs go, both being in Ontario, and I have enjoyed working with her most recently on an upcoming collaboration. being a stay at home mom. She reduced her workload to part time and started up her home based business. During this time Nicole also complete her B.A ~ way to go! 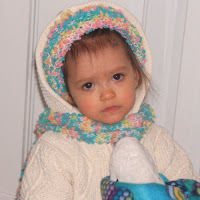 When Nicole was first introduced to cloth diapering, she realized she could use her knitting skills (since age 11!) to make wool covers for Sarah. 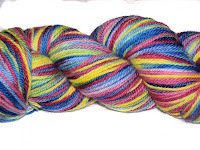 This lead her down the slippery slope of just wanting to try hand painting yarn (I know the slope well, sub in clothing for yarn)... and the rest is history! 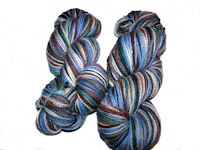 She is now the busy hands behind her blossoming business and many gorgeous painted yarns and happy fiber fiends! Nicole is inspired by her children ~ she says they inspire colour into her work (and then she wonders if that sounds silly ~ not to any mother I know!). She is also inspired by nature and trips to her parents’ cottage (my neck of the woods!) 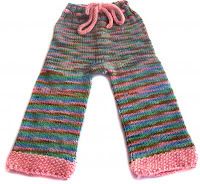 Send her home with bright visions for yarns such as Autumn Sunset and Tree Tops. products. What she likes least is the reskeining of the yarn ~ a tedious job, but a needful one. It seems despite her best efforts, she can’t find any willing volunteers to do it for her! business, and also how to sew, mostly so she can create for her kids. Please be sure to check out Nicole’s work! As always it has been a pleasure getting to know more about the mama behind the work! Rowan has imaginary mice. Or should I say, our house, car, and neighbourhood seem to be dealing with a great imaginary mouse infestation. Everywhere we go, we have to be careful not to step on the mice. Or wave at them as they drive by. Or hold their hands while they walk down the stairs. On Friday we were at the tea shop and while leaving Rowan noticed some sugar on the floor. I assured her that the mice would clean it up ~ which seemed to alarm the other patrons! 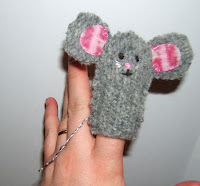 So this weekend, while sitting in meetings, I whipped up a cute little finger puppet for the little mouse lo ver! 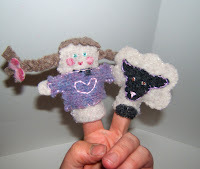 I have a stack of wool sweaters that I have felted with 'upcycled' projects in mind and they seem to want to become finger puppets. I also did an elephant, a second mouse (both of which another attendee purchased LOL) and a sheep. The sheep needed a friend, so I made a little Mary in a wool sweater to take him to school. ﻿Are you a goddess at heart? Well, then you need to meet Aly. Aly is the busy mom behind the business KreativMindz. 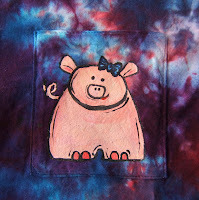 At KreativMindz you will find an assortment of funky handmade items for the whole family~ from patchwork pants to a personalized tooth fairy pillow. 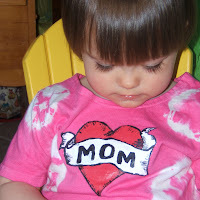 I appreciate browsing her generously s ized mama clothing! 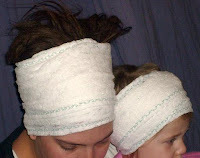 Aly is particularly known for her Goddess Wraps (and Goddess-in-Training wraps for the wee ones). The Goddess Wrap is a perfect fix for a bad hair day, but works any day to add a little vibe to your look. 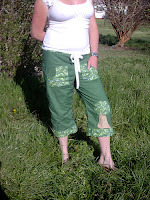 Made in a large variety of colours and fabrics, with custom options, too. Aly is inspired by her family and nature, actually, by the whole big universe! Her inspiration often comes in dreams, which she sees as a valuable gift for an artist. She loves the artistic aspect of custom work and applique and is yearning to learn felting so she can work sculptures for her home and business. 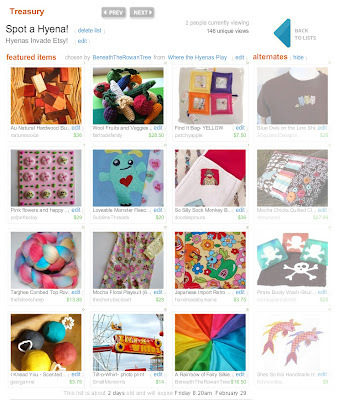 Aly stocks her products at Etsy and at Hyena Cart and is active on My Space. You can get a better look at her past work by browsing through her Flickr album. Take a few moments to browse through KreativeMindz and see the handiwork, both varied and unique of a very creative mind! This post is the follow up to the one previous, which of course will appear backwards to you as you read! So go here to start the process! 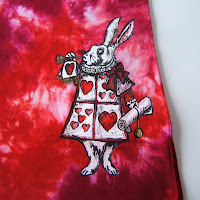 I finished the White Rabbit play dress today. I am so stinking excited about it and don't plan to stock it until mid-March~ not sure if I have the patience! Detailing the bow, sleeve, banner and hands. And finally, in its literary context. Now to heat set it after it cures for 24 hours. Press it, label it and wait... This was a fun project and a challenging move away from my usual style. 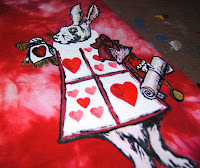 I may have to do a couple more Alice inspired pieces this month! I keep meaning to blog about my progress on any given project, to give folks an idea of the process from beginning to end. I always remember this at the end! In March, the Take Off Your Shoes congo, of which I am a part (and the owner) is stocking to the theme of 'Once Upon a Happily' ~ items inspired by and pertaining to nursery rhymes and fairy tales. 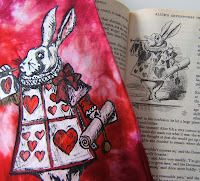 In leafing through a classic (full text) edition of Alice in Wonderland (one of my very favourites! ), I was captured anew by the whimsical woodcut style illustrations ~ thankfully now in the public domain. 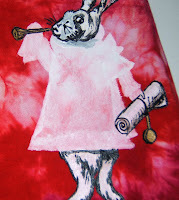 I particularly like this image of the White Rabbit and decided to come up with an piece of clothing for him. 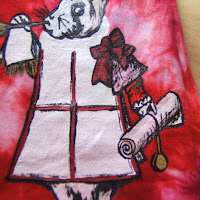 I started with a 2T cotton playdress and proceeded to dye it with low water immersion. Low water immersion is, well, just that~ you can read HERE to find out more about the technique. I chose to work with shades of pink and to add a little red. Well, the red got bossy but didn't completely overtake the fuchsia and soft pink. 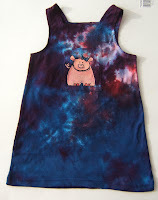 I dyed the dress on an angle, creating more activity and marbling on the right side, building as you go down the dress. Yes, I should have taken a picture of the dress before I started painting, I didn't. Next, I started painting. I paint freehand, so I simply reference the image as I go. Even when I do my own illustrations, I draw them first (I paint much better than I draw) so I can see the lines and shapes. 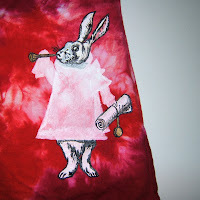 I work with acrylics modified with a medium for fabric. Once cured and heat set, it is permanent and very durable. Picking up my favourite round brush I began with a base coat of white to give me the general shape of the rabbit and to help with coverage over the red (which is difficult with white paint). I then proceeded to work on the bunny in small areas, completing each detailed space so that I could work with the paints while wet for best blending and to create the woodcut feel of shadows and strokes. Yes, I should have taken a picture before I started detailing, but I didn't. At this point, I have the legs, scroll and trumpet done and the head part way there~ I have filled in some extra shadows across the face and will go back at them next foray to create a whiter appearance. Given that other than hearts and shadows, the White Rabbit is, well, white, this little guy is proving to be a great exercise in shading! I have yet to decide if any other part of the dress will be embellished. I am leaning towards no, but time will tell. This dress will take about twice the time of most other designs due to the fine details, but I love to work on a piece that feels really inspired and it becomes a labour of love. I'll check back in and bump up this post once I get a bit more work done on this fine little fellow. Dyed with low water immersion on a fair trade (made in Bolivia) cotton dress with rich jewel tones. I like these dresses as they work well in any season ~ over long sleeves and tights; tshirt and sandals; as a sundress, or next year as a long tunic with leggings. And I love even more that they are fair trade/ coop produced. Rowan officially has 'big eyes' ~ I say officially because we saw the Optometrist this winter and the poor fellow couldn't get out three sentences without commenting on the size of her eyes! By the time I left the office I thought I must be missing something, I mean, I know Rowan has big eyes, but to hear this guy tell it she must be a real freak and I was just a blind mother, missing the obvious. Thankfully her eyes are not dry, scratched, or otherwise in peril because of their incredible bigness. This guy was a little over the top, methinks. She does have beautiful eyes, and yes I am seeing her with a mother's eyes, I may be biased. It is the one thing people always comment on when they meet her. 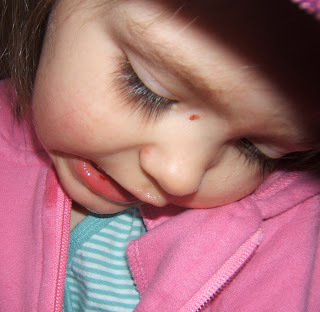 She has inherited both the deep brown of her daddy's eyes and the eyelashes. Oh! The eyelashes. Women pay for lashes like this and in the genetic lottery almost never get them naturally! All of this (this post) was brought on by observing Rowan's lashes this afternoon while they were wet with tears from a finger pinching incident. They really are indecently long! Ok, I am done with my self-indulgent mother posting for tonight! 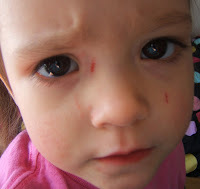 The scratches on Ro's face are another story altogether (think : When Toddlers Attack). My latest round of dyeing brought forth some pretty things for spring! They remind me of the lovely shades of the lilacs in May (or June around here) and the lilac scented gentle days of early summer. While tinkering with purple to get just the right shade, I decided to use up my experiments~ and I love the results! 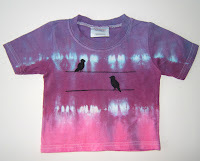 The peasant blouse has gone to its new home and the little birdies list today. I will definitely be mixing up some more of my first official 'colorway' ~ Lilac! Well, if your child is tantruming, I mean! "Cry for Connection: A Fresh Approach to Tantrums"
We practice 'Unconditional Parenting' which falls in the category of gentle discipline. We don't use punishments or rewards (which manipulate a child's behaviour with things like love withdrawl, conditional approval etc. which involve 'doin to' a child)~ rather we try to work with our child to reach our common goals. Sounds wild, huh? It is kind of crunchy! We love it! But we are also just coming up against our first real behavioural challenges of any might ~ the 2.5 year old temper tantrum~ and struggling with how to manage while keeping our broader parenting goals in mind and respecting our daughter's emotional state. This article really helped me shift my thinking from tantrums being something to stop/ avoid to something needful as part of Rowan's experience and our parenting. I was in tears reading it, because it is where I want to be. We already stay with her and talk about the feelings, but I know the panic in my gut to stop/ avert/ avoid the tantrum has got to go. I can honestly say we have never just 'allowed' a tantrum to rage through to the other side. I am sure we will get a chance later today! I'll check back in. I knew something was up with Rowan lately. But I keep saying, this just *isn't* my sweet little girl. Tell me other mothers experience the same things, if you must. But I have an explanation for it all now. My sweet little Rowan has been replaced with a look-alike from another planet~ apparently Mars, as I am told I should know by the 'jewels' and 'antenenans'. 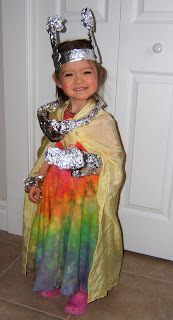 I just wish I knew where the grouchy little pod parked her spaceship so I could send her home and get Rowan back! I have always had a deep fondness for the Old Shaker song Simple Gifts the lilting melody and simple message. It evokes childhood and happy times. Today's mail brought Rowan a new dress from Barb of the Sunburnt Geoduck on Hyena Cart. 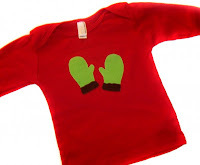 Custom made with room to grow (it is made with a soft stretchy cotton and I expect Rowan will be wearing this for the next two years! 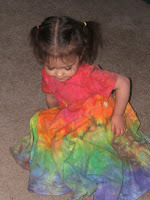 ), this dress is hand dyed in a lovely low water immersion rainbow. But it isn't just pretty. This dress *twirls*. 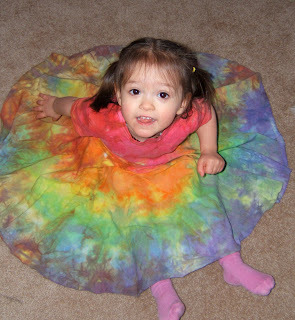 I mean, really twirls~ the fabric has a nice weight to it and it really swings! Rowan put the dress on an hour ago. She is downstairs with the sitter and I can still hear her giggling, twirling, falling and shouting with delight in her new dress. It isn't very often that a child (or an adult!) responds with such glee and physical action to a piece of clothing ~ but this simple little dress has something special, it is artfully and lovingly made and it suits Rowan perfectly. It is the exact accessory she needed to turn and twirl in her little valley of love and delight! Yes, dyeing puns never get old. They just never, ever... dye! I tend to do do my dyeing in bunches~ dyeing uses a lot of water, and dyeing in large bunches also allows me to make the most of each batch of dye I mix. I have to order my dyes from the US and between customs and taxes, waiting on shipments (customs always seems to get suspicious and open my dye chemicals! I suppose something nefarious could be done with Bubblegum Pink or Cayman Island Green when mixed with urea and soda ash... like a really pretty shirt...) it is a pain in the neck. So I treat my dyes like powdered gold. This means that when I have a batch mixed up, I am determined to use every last precious drop. So I pile up the planned projects, o rders for customs and new pieces, too. I work through them, but inevitably I have a bit of this and that leftover. That is when bad things happen (but not as bad as what happened the first time I saved dyes and tried to use them a day later, yikes!). Unplanned, heedless of color theory... I start grabbing white cotton stuff. Socks, blankets, tights, bandanas... Never thinking that the wonky pieces I create while doing this probably cost me more than the few leftover tablespoons of dye. It is a compulsion. I admit it. But every once in a while it works (the two items pictured are spur of the moment, use up he end of the dye receiving blankets). Of course, then I can't repeat the effect! ETA: A picture of my hand... 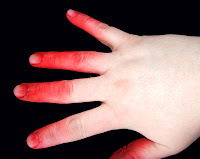 I wore gloves this time, but this is what my hands look like when I am done! Only this time the gloves only leaked red and brown. Nothing pretty like the day I had a sunrise thumb! 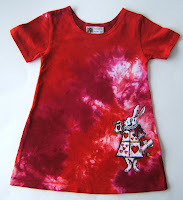 People often have concern about whether painted clothing items will stand up to the wear and tear of children. and whether dyes will fade or run. Good questions! The answer depends on your materials and process ~ quality makes a difference. For dyeing and painting all of our fabric and blanks are pre-treated with a special detergent to remove all traces of sizing, stain treatment etc. that may repel or affect the processes to follow. 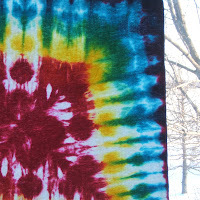 We dye with professional Procion dyes which are fiber reactive~ meaning the dye molecules bond with the cotton/ natural plant fiber and create a permanent bond. No fading, no running. After dyeing we triple wash all items with the same detergent to suspend the chemical reaction and rinse away any undeveloped colour. We do recommend that folks wash brighter items (especially turquoise and black based) in an old pillowcase the first couple times because excess dye may be shed that was not, for some reason, washed away in the cleaning process. We use unscented products throughout the whole process. 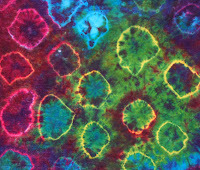 For painting we use high quality acrylics and a fabric medium. We cure all of our pieces for a minimum of 24 hours before carefully heat setting the designs. We suggest that folks lay or hang the items to dry and press inside out if needed. Otherwise, the items are wash and wear, just like any cotton clothing. Of course, over time, the items will show signs of wear, just like mass produced children's wear. Paint will fade a little in brightness and may show mild seaming, but does not crack or peel or affect the overall design. 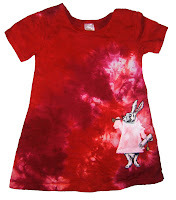 I have pictured one of my first creations being worn by my daughter a year ago, and again this past Sunday... you can see that the painted surface is still in excellent shape after a year of regular wear (maybe 40 washings?) and as an added bonus, the playdress is still a wearable item with a pair of leggings! We had a fun visit today to the Kearney Dog Sled Races. Light snow and fairly mild temperatures made it enjoyable to stand along the track and enjoy the sight of well trained athletes running their hearts out. And one adorable little 'dog' pulling her own sled! As a long time dog fancier and former obedience and agility competitor with my two dogs: Callie & Briar (Callie, the Nova Scotia Duck Tolling Retriever, passed away in July 2006 and Briar, the Brittany, is now a maturing gentleman of 10), I still love the dog sports and enjoy seeing Rowan's delight in them as well. Rowan and I stood along side the start line and she called out 'MUSH' to the teams going out and clapped for those returning (and ate some dirty snowbank snow~ once when I told her not to eat the snow as it had gas fumes from the snowmobiles and dog pee in it, she turned to me, took a big bite and grinned "I LOVE dog pee!"). 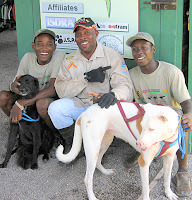 One of the highlights of this year's races was the participation of the Jamaican Dogsled Team. Yep, you read it right. Gets the same reaction as Jamaican BOBsled team, doesn't it?